At the final whistle, the players in red converged one another. 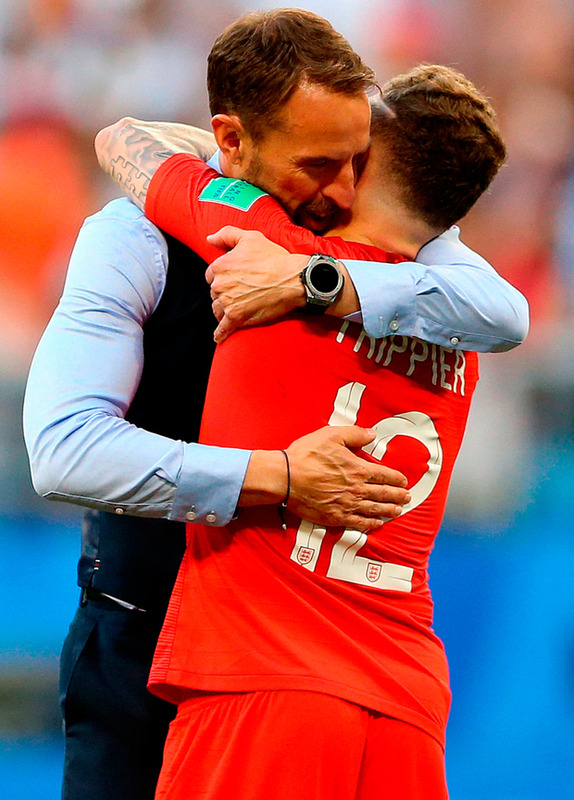 Gareth Southgate was locked in a bear hug with his staff and a party was already under way behind the goal to their right. England had booked their place in a World Cup semi-final and it has been so long coming - over a quarter of a century since the last occasion - it was no surprise that they would soon be dancing on the pitch as well as in the stands. If we were to be picky, a legitimate argument could be made that, yes, England will need to play with more finesse if they really are to harbour serious ambitions. They will have to pass the ball with greater efficiency and maybe, in possession, show a touch more arrogance, in the manner of a side that really believes they can do it. France, for example. Or Belgium. For now, however, Southgate and his players are entitled to cherish these moments bearing in mind the last time it happened Bobby Robson was manager and Spitting Image's puppet of the England manager was a senile worrier called Rubbisho. Turin, 1990, with the penalties, Gazza's tears and all that, is written into England's history. This time maybe there will be a happier ending. England could be forgiven for wondering what glories might lie ahead and, on this evidence, they should not hold any fears about Wednesday's semi-final. Why not be confident, after all, when England have now scored as many goals, 11, as Alf Ramsey's team did to win the competition in 1966? Eight of them, astonishingly, have come from set-plays, the latest being the header from Harry Maguire to swing this game in England's favour from a corner on the half-hour mark. Dele Alli soothed any lingering nerves with the second goal just before the hour and, amid all the euphoria, Southgate might be on to something if he reckons his team can play considerably better than they did for their latest victory. Early on, in particular, it must have been disconcerting for Southgate to see the way his team struggled to find any rhythm and in those periods it was tempting to wonder whether the occasion had got to a couple of players. In their previous games, England had been so quick to set the tempo, passing the ball incisively and making it clear, from the first minute, that they would be happy to take the game to their opponents. That was not the case here. Everything seemed so laboured and, until the goal, it was difficult to remember a single noteworthy chance other than perhaps when Harry Kane let fly from 20 yards and put the ball past the post. Ultimately, though, that sluggish start can quickly be forgotten given the way England assumed control once they had taken the lead from their first corner of the match. 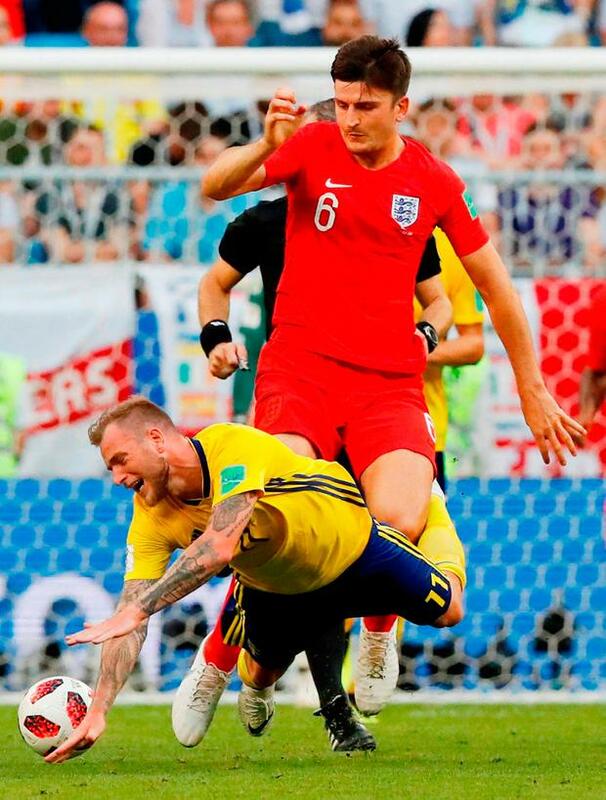 No other player in this tournament has won more aerial challenges than Maguire and it was strange, to say the least, that Sweden had designated Emil Forsberg to mark him. Maguire, to put it into context, had a seven-inch height advantage. 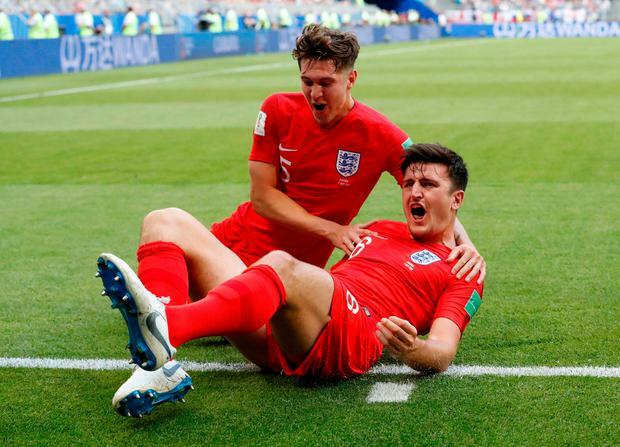 It was a mismatch, the ball thudded off Maguire's forehead and England had scored from a corner for the fourth time in this tournament. To be critical for a moment, there is a school of thought that England are straying close to being too reliant on set-play goals. A better argument, perhaps, is that Southgate's players have discovered a useful weapon to help outscore opponents. And, besides, it is not as though England have shown they are incapable of putting together scoring opportunities through open play. Their second goal here was the case in point, featuring a concerted spell of attack-minded possession, a pass played back by Kieran Trippier, the cross from Jesse Lingard and, finally, Alli with a header at the far post. 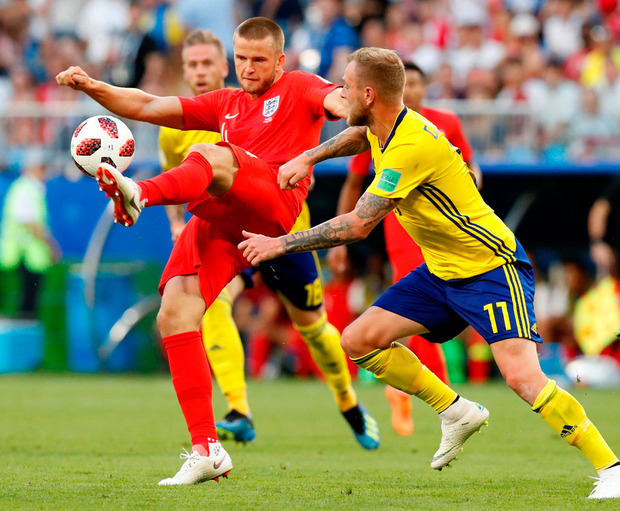 Sweden will reflect on the saves Jordan Pickford made from Marcus Berg at the start of the second half and, brilliantly again, when Victor Claesson had the chance, at 2-0, to change the complexion of the match again. 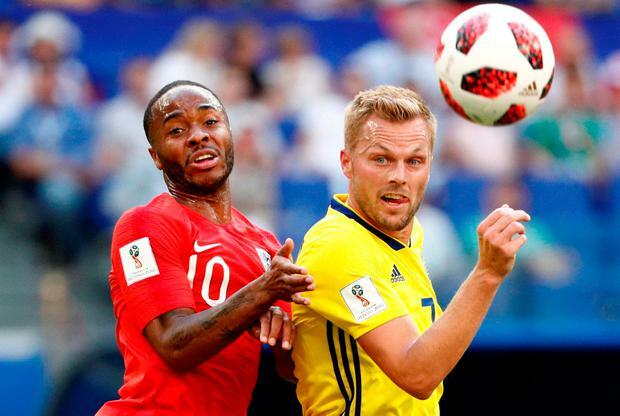 By then, however, England had emerged as the dominant team, controlling the ball and unfortunate perhaps that the best of their chances fell to Raheem Sterling rather than, say, Kane. No matter, though. Sterling played his part, always running, looking to create mischief and England got through the game without any yellow cards for the three players - Kyle Walker, Jordan Henderson and Lingard - who would have missed the semi-final with another booking. Southgate's team, in other words, will be at full strength. Anything, as he says, is possible.